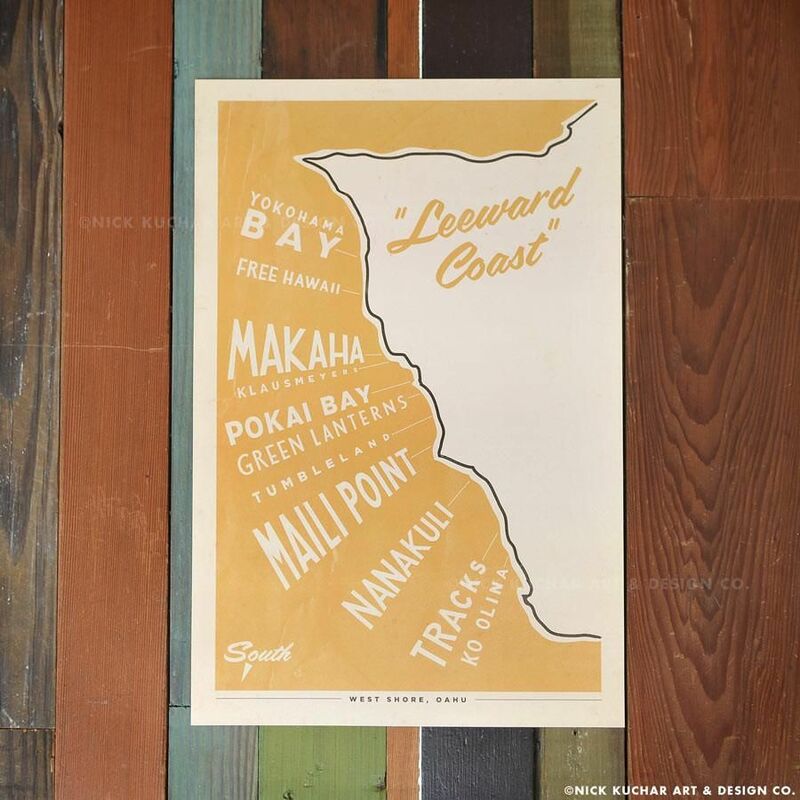 Nick Kuchar is an Oahu based artist who loves capturing favorite locations of the ‘aina (land) of Hawaii through his line of vintage-inspired surf and travel art. His creative process takes him throughout the islands where he looks for inspiration at surf spots, hikes, lookouts, historic sites and more. His process involves onsite sketching and photographs that are then taken to his studio where he uses a mix of acrylic washes and digital illustration to bring his vision of these locales to life. Before falling in love with Hawaii and relocating 13 years ago, Nick grew up drawing and surfing in Florida. After graduating from the primary colors, he attended Auburn University where I earned a degree in Industrial Design. Catching waves, spending time at the beach with his wife and twins, listening to Muddy Waters and driving his VW bus are a few of his favorite things. He is inspired by the early days of surfing and beach culture, including the vintage color palette, typography, and nostalgia that goes with it. He has been blessed to have collaborated with Patagonia, Birdwell Beach Britches, and Jamba Juice to name a few. Most recently, he was the official artist for the 2018 Molokai to Oahu Paddleboard Race.